G,day….I have been checking through some of my old threads and as Gerry pointed out, a lot of links to my photo’s have been lost. So I thought that it might be appropriate to do a short summary of work done to date. The room that I had allocated for my layout had in its former life been a parents retreat ( with 5 children that had been a necessity.) but now it’s been 5 years since the last left home. At that time we converted the flat down stairs to the main bedroom and the retreat was left empty. Now this room was not suitable for a round the walls layout. 2 walls have windows, another has built in storage and a door, the last has a door leading to what is now the guest room. The other factor was that I did not really want to build a big layout, just something that I could just poke along with when the mood strikes. As regulars know it has been close onto 2 years since there has been much done here, but now that I have my 7.25 inch gauge loco running it’s time to do a bit more. 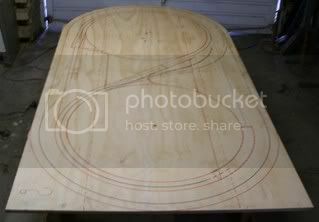 In a lot of magazine articles you see reference made of beginners getting a sheet of ply ( 8x4foot ) and building on that. Usually this is belittled by the author who is in the midst of building a “quarter acre, $200,000 Empire”. When thinking about it the thought struck me that this would be an ideal size. 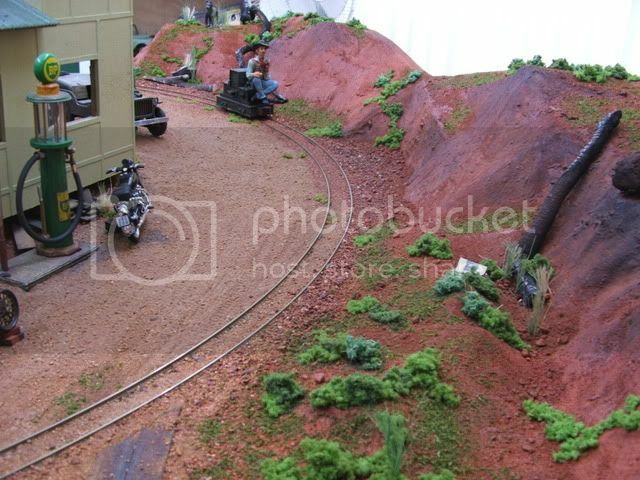 In the room I could walk all around it to operate all points and actions on the spot, scenery and track laying would be in easy reach, no excuse for not finishing buildings on all sides as this is how they would be viewed. Also I didn’t want to build something that had to be destroyed to remove it from the house when I eventually fall off the perch! This is something that I have no plans on doing anytime in the near future. This photo shows the original plans drawn up on the sheet of plywood. This is as close as I have ever been to drawing plans of anything. Next we have rough test of the levels that the track runs at. Radius on main lower track is 24 inches and on climbing branch line is 18 inches. Next in line we have the L girder frame being constructed. 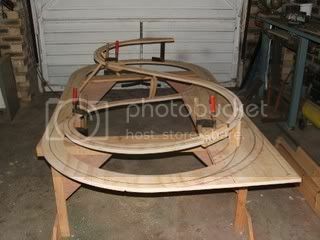 The last photo shows the ply being attached to the frame. Because of the central ridge and buildings the track on the far side can not be seen, giving the impression of a much larger size. I will post more on this if anyone is interested later in the week. Last edited by SOUTHPASS on Mon Feb 14, 2011 1:16 am, edited 2 times in total. Nice to see the start John, my vote keep posting, will be great to see the "finished" article again. 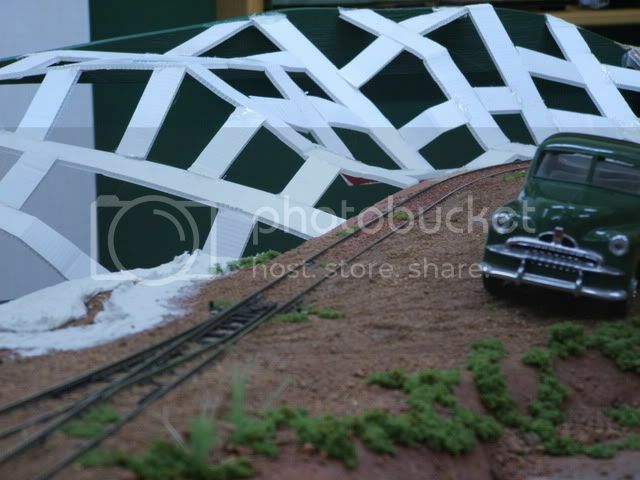 Using the 'L' girder and elevated track will make for some great scenic development. The board size should make it relatively straight-forward to move. Like the idea that you can view the layout from all sides! Add another vote to "rebuild" the thread! Your layout has a distinct flavor that is truly enjoyable ... and that applies to several more folks for each one who chimes in. Great John keep them coming, I enjoyed it the first time round. it will be fun to refresh my memory. I like it! Back when I did HO it was all plywood and plaster. None of this fancy foam stuff! Good morning…..well it’s morning here. 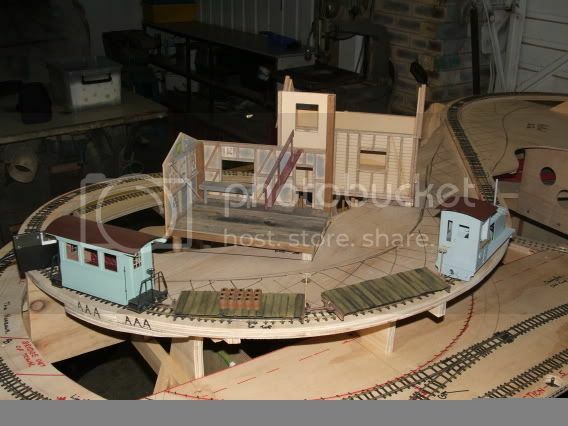 The first photo shows what I call the East End of the layout. 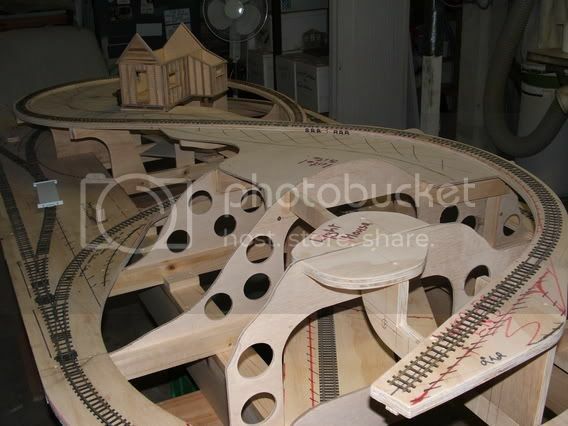 This clearly shows the contour boards that are fitted under the track and scenery. Don’t take too much notice of the hotel or lighthouse written on top spur, this is now designated spur for loading of clay for Bexhill Brickworks ( all names used have a place in my past, I will explain one day ). Under this hill you can just distinguish the 2 storage tracks. Run around track on left is the main junction of Swingler and track running off to right is start of branch line up through Parkers Corner and on to the clay pit. Next we see a train having just come up Womblebank and entering Parkers Corner. 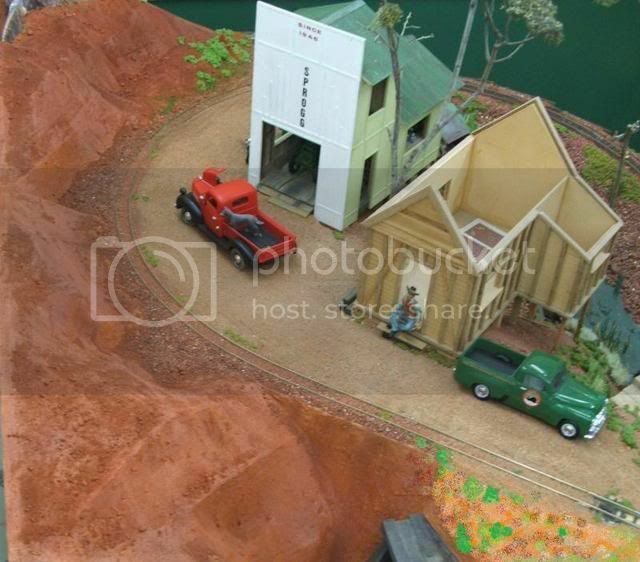 Behind train is Sproggs Garage and Doc Winters cottage. Lower track you see is at Swingler. 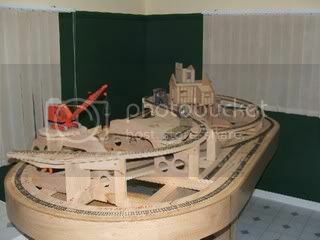 This last shot gives an overall view of the layout. Dragline has now taken up position at the clay pits ( I will name that area one day ). On the right hand side is where Bexhill Bricks are situated. Spur and mainline have now been swapped over. Short spur at top between Parkers Corner and clay pit is where Southern Cloud Foundry & Fabrication are to be found. I can see a great temptation to cosmetically finish the bottom edging of that baseboard off as a skip chassis with dummy axleboxes beneath the frame. Nice piece of woodworking. I like the relief holes in the verticals... Don't think I've seen anybody do that before. G,day....Well it has certainly been some time since there has been any work done on the SOUTHPASS LINE, about 3 years I think . A few things have taken my spare time, initially this was my 7.25" gauge loco and in more recent times health issues in the family. 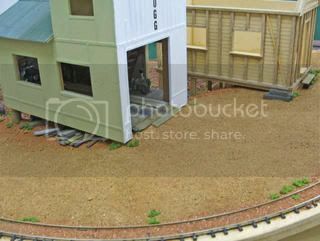 But the thing that has got me back working on the layout has been the incessant rain, there has hardly been any let up since October and as you may have seen 75% of the state is under water. This is after 7 years of drought. Having not done any model work for so long getting the eyes and hands co-ordinated is taking some doing, so I am starting back with a piece of simple scenery work. For a long time the area across the tracks from Sproggs Garage as needed some substance so this is the first place to get attention. My usual method is to form the contours by cutting strips from real estate signs about one inch wide ( these are the ones printed on a corrugated sheet of plastic ). I glue pieces together with hot glue, this gives me a foundation that is impervious to the the water and glues used in the following steps. 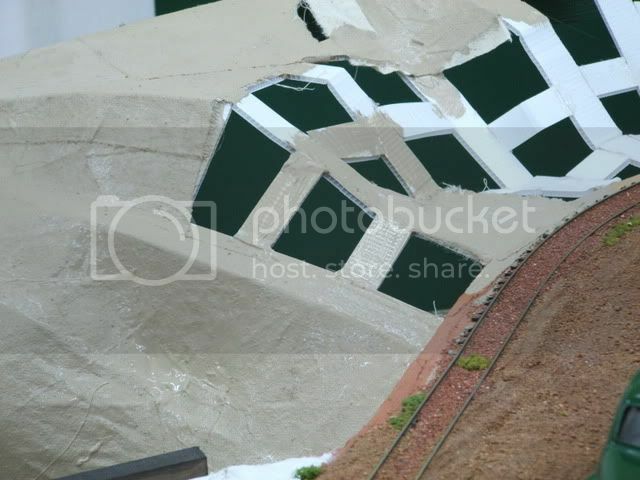 When I get a bit more of the covering on I will post some more photo's. It feels good to be doing some work on this again. Hey - great you are working on the layout again. Hi Bob - the first time I read it, I missed the slippage of years between your latest post and the one before it! It's good to see your layout again, and I'm looking forward to watching progress. The pictures of the floods are horrifying - I have relatives in Brisbane and I'm hoping they are OK - I guess they have other things to think about than e-mailing me. Dallas_M wrote: Add another vote to "rebuild" the thread! Your layout has a distinct flavor that is truly enjoyable ... and that applies to several more folks for each one who chimes in. Good to see your post. I was wondering how you fared with all the floods as on google earth it seems you are just north of Brisbane. 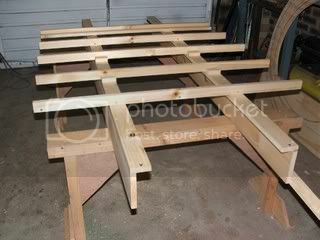 I have managed to get the covering over the lattice work. I use squares of calico for the basic ground. 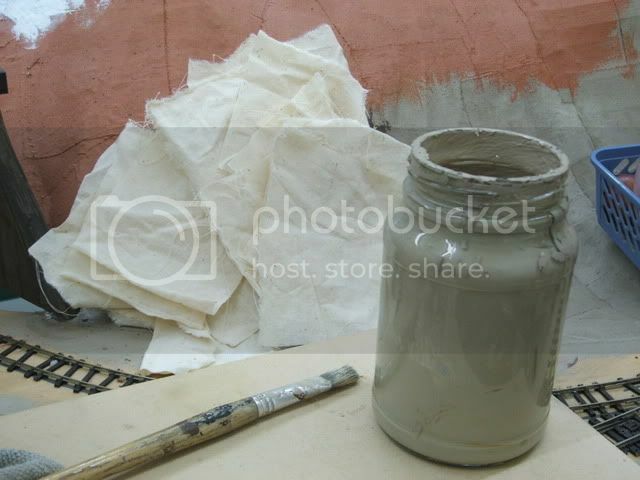 This is put down with a 50/50 mix of latex paint and PVA wood working glue. The pot I am using was mixed over 3 years ago and I was not really expecting it to be still usable. 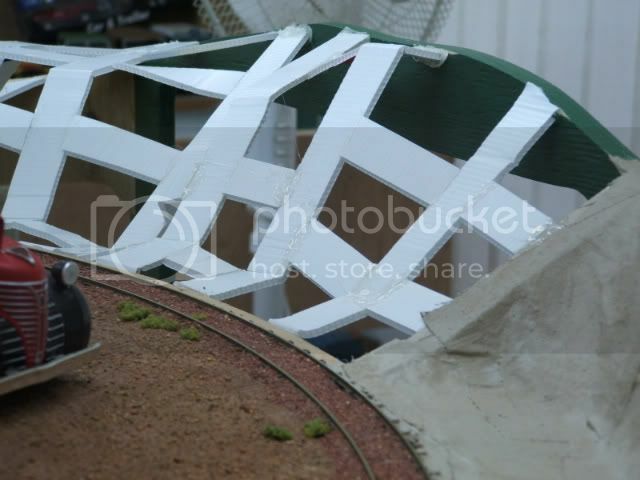 The glue/paint mix is first applied to the lattice. the calico laid down and then the mix is thoroughly brushed into the material. This gives a very strong and flexible surface. The calico is overlapped to give an average cover of 2 layers. I have a total dislike of using plaster by itself as a cover, but I do mix it into latex/vynal paint to give me a texture finish. By using earth colours throughout you don't get white patches that can show with knocks. If I had not had the glue/paint mix done the tan colour it would have been replaced with a more local red soil look that I use over this base. Over the last 2 days I have been adding textures over this area. Tomorrow when it has dried and not so shiny I will take a couple more photo's. Wow, seems to go fast and looks great, good idea with the base colour incase of small damage and using the cloth instead of paper is a great idea. It is sad you have to cover up that beautiful wood work though it looks so good. Hi John, It's great to see more updates of the line. The way you build the scenery is very inspiring. Great idea to use calico! Must give that one a try sometime. Good morning....One of the joys working with the latex base, as soon as a skin is formed you can continue on with the next layer. But I have to admit that I started doing this section about a week before Christmas when the heavy rains started and I couldn't get out into the garden. I had to ballast some track that would become inaccessible with this present work, the problem then was that with the dampness of high humidity work that normally set-up overnight took a week to harden. 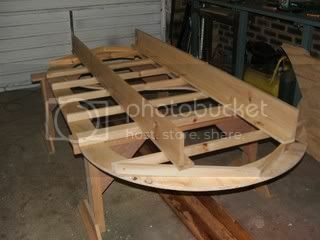 One of my other hobbies is wood work, apart from the initial sheet of plywood most material has come from my stock of cut off's. The weather has backed off the last 4 days and we have been getting some good sunshine. That's funny because we are used to having weeks ( some times months ) on end without seeing a cloud. Tomorrow I will start taking away about 3 trailer loads of palm fronds that have fallen over this time and cutting back hedges that are going wild with all the extra water. I will upload some more images today of the near finished area. Well another layer has gone down. The first one that I used here was paint/glue thickened with a bit of plaster ( plaster of Paris in this case, I have used various patching plasters with equal results ). The paint colour is Hot Ginger which is close to the earth tone that I wanted. Also in its favour was the fact there is 2 litres in the workshop. Over this was sprinkled a coat of dirt and gravel coloured with a teaspoon of cement colouring( Red Ochre in this case ) and a spoon full of plaster just for good luck. A light spray of wet water settled this lot down, then I used a syringe with PVA/wet water to fix this in place. You may have guessed that I use no science in my work. just potluck. If I'm not happy with a section I will go back a step or two and just cover it up. 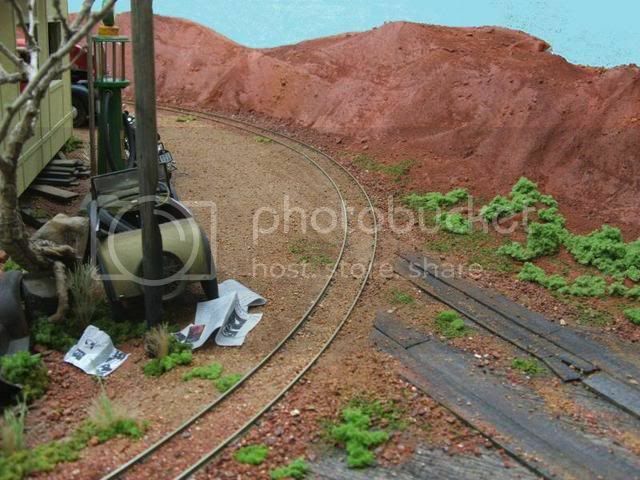 Hi John - the scenery is looking very good, and really transforms the look of that edge of the layout. Great work. Looking good there. Thanks for taking the effort to explain what you do. G,day again....Just a couple of shots to show the finished area. Finished in the sense that the major scenery is done. As time permits details such as rubbish and better bushes will appear. 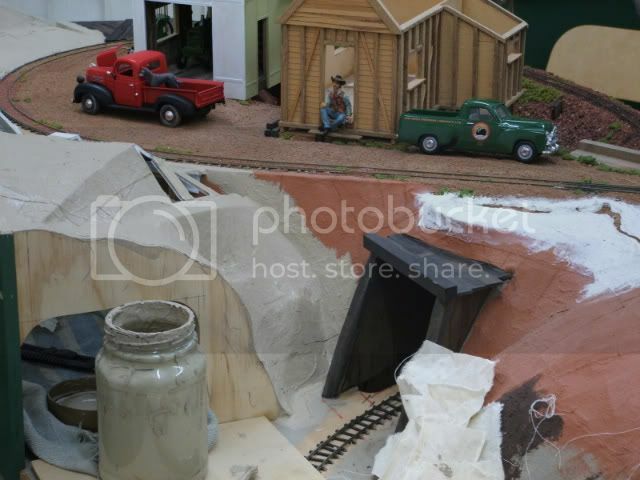 This first photo shows the ballast in the tunnel that gave me trouble with the humidity. Rocks above truck are pieces of pumicestone suitably coloured. These I pick up from appropriately named Pumicestone Passage which runs between Bribie Island and the mainland. Even after a million or so years it is still along the shorelines, not like New Zealand where they keep producing new stock . Blackening of rocks was done with a wash of leather dye thinned with methylated spirits. 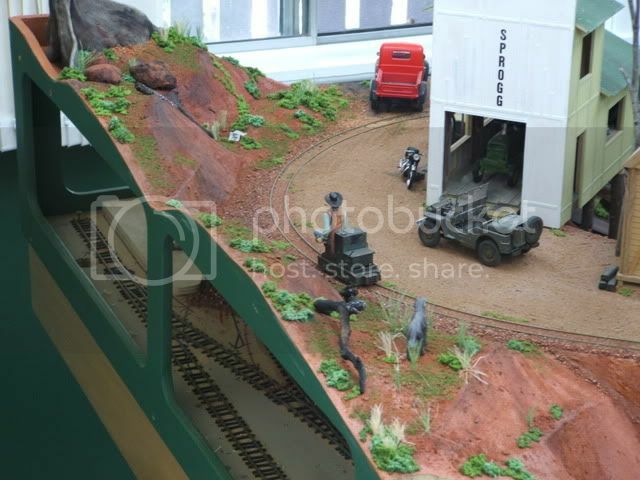 Under the scenery you can see Swingler station, it will be finished as a kind of inset diorama. 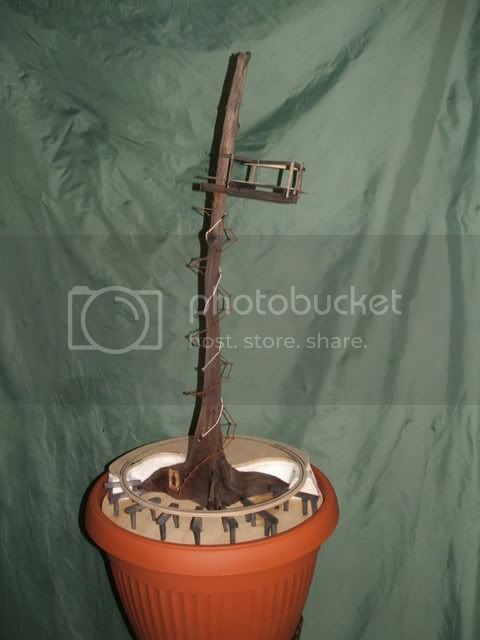 The tree base you can see in 2 photo's is the Tower of Terror taken from my Pottsville layout. Your layout looks good. Leaping ahead at a great rate. 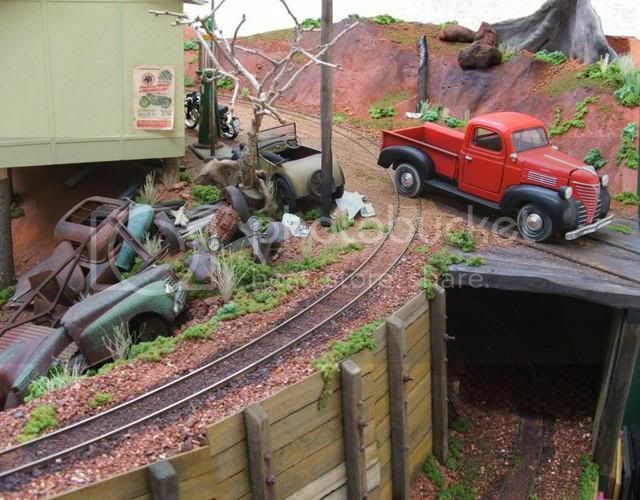 Love the scene with all the car bodies in the gully ...... really realistic. Looking forward to see how the rest progresses.